Vaping, Flavored Water, and Too Much Damn Choice – Sunshine. Whimsy. Tacos. It’s been just over five months since I moved back to the US, and the wonderful Itchy Feet comic above is spot on. I feel like I’m mostly re-acculturated, but there are still things that take me aback. For example, the Vaping trend is out of control here. Before I moved back, I had no idea what Vaping was, but it’s everywhere now. There are stand-alone stores, and an entire industry has popped up around electronic cigarettes. The technology has evolved to the point where people are charging their cigarettes with USB ports and changing out modules to reduce the amount of nicotine or flavor their smoke with applewood or whatever. Some people claim they want to use this to quit smoking altogether, but this seems to me like the opposite of that. To me, this looks like they’ve simply designed a more efficient nicotine delivery system. At least we’ve decided as a people to hydrate properly. For the first four months I was here, I still shopped for groceries as if I were still living in Germany. This was partly because I was living with my brother and I didn’t have a full kitchen or pantry to fill, but some of it was simply habit. I had spent three years shopping with my own canvas bags and only buying as much as I could carry in one go because I would have to walk it back home. Now that I have a car with a hatchback, my quantity has increased, but I’m still not shopping quite like a person who lives here. I blame Cheerios for that. You heard me. I said I blame Cheerios. When I left, there were three Cheerios flavors. There was Honey-Nut Cheerios, Multi-Grain Cheerios, and plain old infants-love-’em plain flavored Cheerios. Not so, now. If you look closely in the picture below, you’ll see Multi-Grain with peanut butter. You’ll see chocolate cheerios. There’s apple-cinnamon Cheerios and Cheerios with protein added. In one store, I counted twelve separate varieties of Cheerios. 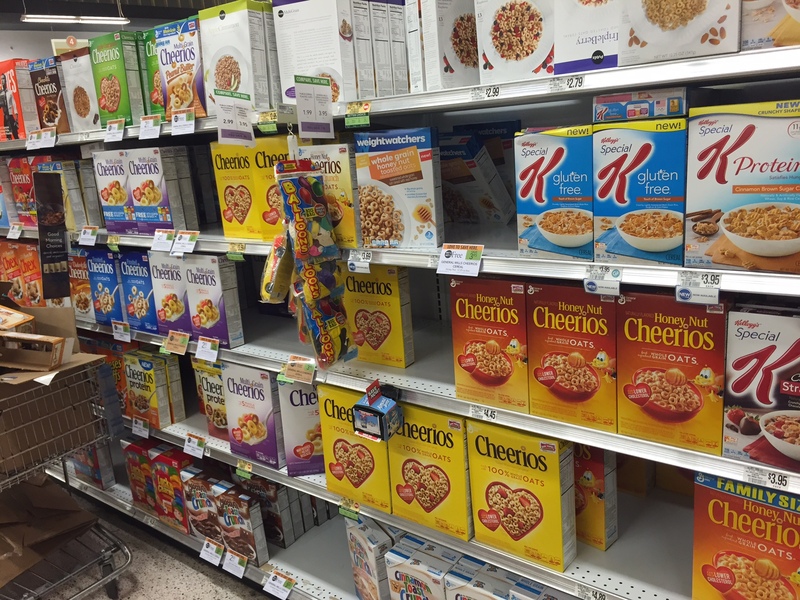 The breakfast cereal aisle has become the Cheerio-verse. When did this all become so complicated? Grocery shopping in the US has always been an exercise in overwhelming choice- remember when I posted the picture of the peanut butter and jelly aisle? It’s gone over the top, now. 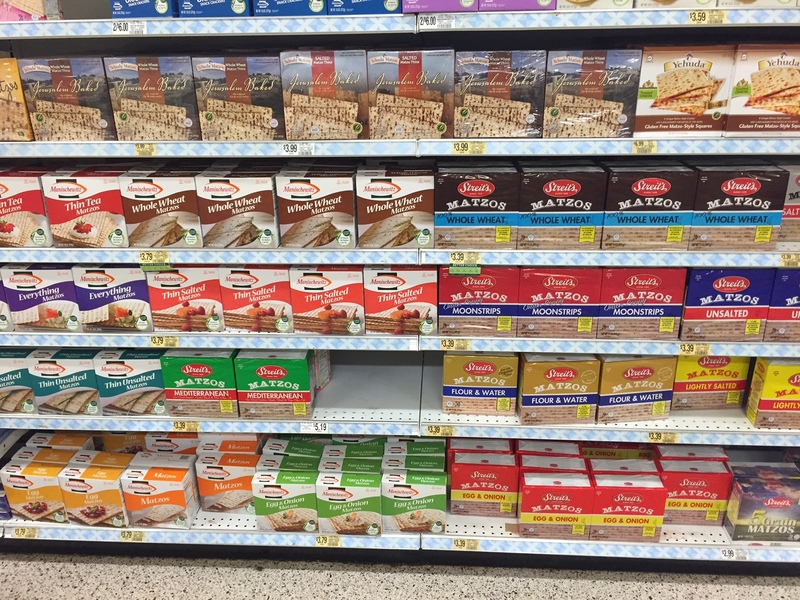 Even something as simple and ordinary as Matzos suddenly has at least a dozen possible varieties. I also still feel like I’m boiling inside my skin any time the temperatures crests above 75 degrees Fahrenheit (or 24C,) but that’s a gripe for another post. What’s your favorite breakfast food? Is it double-chocolate protein Cheerios? Every day, I make a two-egg omelet. I shred some Colby Jack cheese for the filling, add a little flavored salt, and booyah, breakfast! If it’s the weekend, I might have some bacon too, or chop up some spinach to go with the cheese, and make some coffee with my little French press. If it’s a work day I pack up the omelet and an apple and eat at my desk when I get into the office. Sometimes I add a protein shake if I’ve been to the gym that day. It does get boring sometimes but it’s one less decision I have to make about my day, which frees up my brainmeats to do other kinds of thinking! Your breakfasts sound better than my breakfasts. I’ll get to that in another post very soon. In fact I’m starting to get a little panicky just thinking about it. Food manufacturers figured out that it costs less to extend one product line than develop and market a new product. Thus the 32 flavors of Oreos were born. Welcome (back) to ‘murica. I can relate. I was stationed in Germany for a bit and when I got back, there were tons of products that I missed. Kinder Eggs are just one example. But, then, to add insult to injury, I had massive amounts of options available to me when I was looking for a replacement for those products. It was actually a bit stressful. Thank goodness I was still in the military and the chow hall made a great deal of those decisions for me. I know. It’s a tragedy, but I know. A friend mentioned Vaping to me a while back, and I totally thought it was the newest club drug or something. So bizarre. I completely agree that it doesn’t seem like it’d really aid the quitting process. Simple answer to the Cheerio query: Honey Nut. That is all. Plain ones taste like chalk to me, bleh. I like the multi-grain quite a bit. It’s a tiny bit sweeter than plain. That is just crazy about the Cheerios. Chocolate?! Seriously!? I feel ya, though! When I was in the States at Christmas I was blown away by all the options of every single different product in the grocery stores. So. Much. Variety. I agree with you about ancient grains. My step-mother was telling me about a recipe yesterday which included the phrase, “let it congeal.” I had to stop her right there, to suggest that the word congeal should never be associated with food. It’s just not tasty sounding in the slightest. I counted fifteen varieties of Cheerios on that page. That’s insane. A few years ago, a friend of mine commented that when he was a child, he never imagined that one day he’d have to recharge the batteries on his phone, his book, and his cigarette. I feel the same with the choice thing. But then again, it drives prices down the the competition. There wasn’t enough choice in Germany and there were never deals on in the supermarkets which made my weekly shop pretty expensive. I’m with you on vaping. I can’t believe it’s ok in buildings – I saw someone vaping on a train the first week I got back and was looking around to see if anyone would complain. Oh my goodness. “Grocery shopping in the US has always been an exercise in overwhelming choice” SPOT ON. Not even just grocery shopping, but shopping for pretty much anything feels overwhelming. I have a bad habit of skipping breakfast. I found these Strong+Kind Bars that are right up my alley, though – savory granola bars! They’re awesome when I want a snack but not something sweet. They have Roasted Jalapeno, Honey Smoked BBQ, Hickory Smoked, Thai Sweet Chili, and Honey Mustard flavors. They sound like they’d be weird but they are surprisingly not weird. Ah yes. Americans love their falvors. Whether it’s new pumpkin spice oreos or beechwood apricot ale (whatever that means), we love to have things come in a variety of flavors. The choice in flavors here are overwhelming. 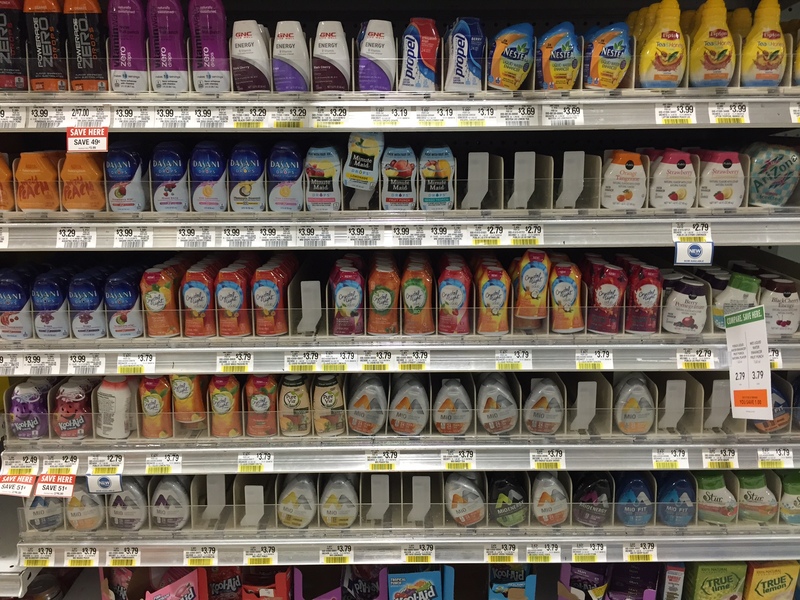 I have to say, though, I love all the crazy choices I get for coffee creamer (I saw girl scout mint cookies coffee creamer the other day); when I lived in China/Japan I was lucky to find creamer at all!